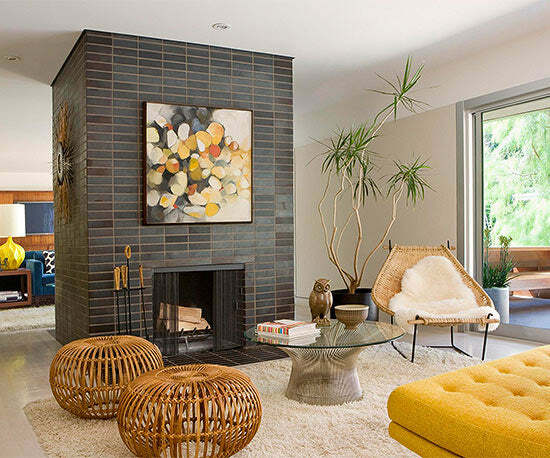 A fireplace is a natural focal point in any room. Add interest and warmth to your home with these fireplace face lifts. If you want to see more Fireplaces, "like" this Archival Designs' blog on Facebook, and I will continue with more next Thursday! This living room is warm, comfortable, and sophisticated -- perfect for relaxing or entertaining. The limestone fireplace is the focal point of the room, with the elevated stone hearth, and white wraparound mantel. A white mantel contrasts the stone surround, and corresponds with the pops of white throughout the room. Furnishings in grays and light taupes reflect the tones in the fireplace for an overall cohesive look. Paired with built-in storage units, this fireplace becomes a natural anchor point for the living room's furniture arrangement, thanks to its substantial expanse. White sofas and chairs arranged in a U shape are positioned to have a view of the fireplace. The room's light color palette keeps in step with the white finish of the built-ins and fireplace mantel. A black fireplace surround adds stark contrast, which is softened through repetition of the black lanterns on the shelves and dark furniture legs. 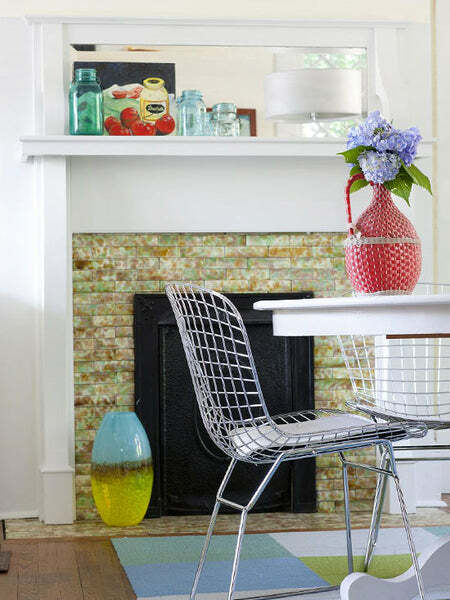 Branch out from brick and give tile a spin on your fireplace surround. Available in almost endless colors and styles, tile can bring a distinct look to a dull surround. Consult your local tile shop or masonry pro to determine what materials and application are best suited for your specific fireplace. A simple fireplace makeover can begin with items you already have in your home. Shop your existing inventory of accessories and display a few on your mantel for a quick, no-cost refresh. Open floor plans are a staple of modern homes, but can sometimes limit the cozy factor. Rather than built into a room-length wall, this fireplace is stationed in the center of the room, creating a room divider that doesn’t completely cut off the two living spaces from one another. The thick pillar is made up of dark tone bricks in varying shades of gray. The firebox itself is basic with a simple black chain curtain and no frame. Varying gray tones add dimension to the fireplace. 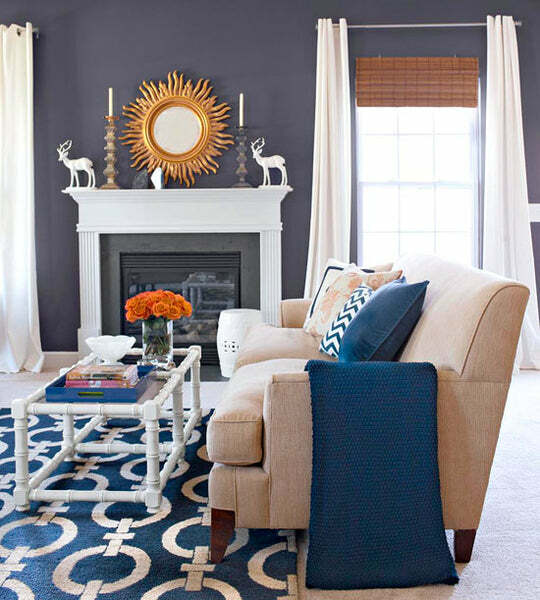 The dark color juxtaposes the light, cheery colors in the rest of the room, creating a thoroughly modern look. A wooden fireplace surround is unexpected in this white living room, but it adds a sense of warmth and a natural touch. The dark wood tone contrasts the white room, but gives off a calm, homey feel rather than a stark, modern look. 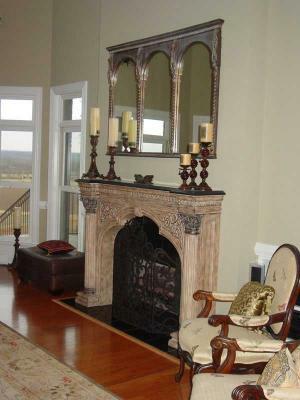 The carvings on the sides of the fireplace and the mantel add detail and character. Dark artwork above the fireplace and black accessories on the mantel repeat the rich tone of the fireplace, creating a sense of rhythm in the living room. Marble has long been a luxe material for kitchens and baths. This fireplace brings the material into the living room. Pairing the material with shades of gray used throughout the space exudes casual elegance.